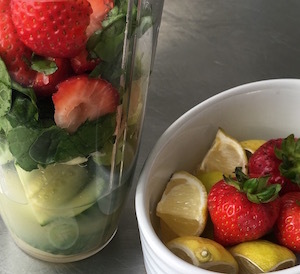 My ‘Pimms’ smoothie is a ridiculously fruity blend, without a drop of alcohol in sight. 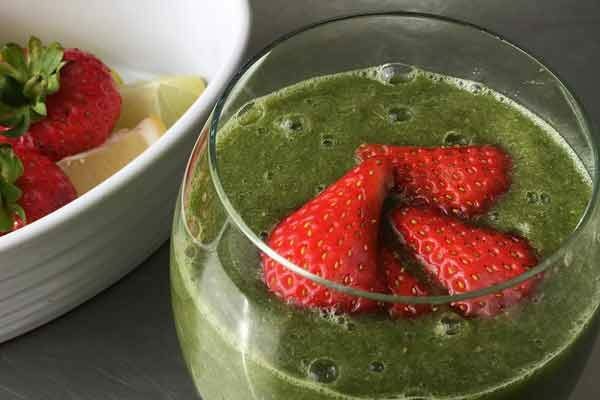 Simply whizz together a large handful of strawberries, 1/4 of a cucumber, juice from a thick wedge of lemon, a knob of ginger, a couple of lettuce leaves, a few sprigs of mint and a splash of apple juice – and serve! … which brings me neatly to the CUCUMBER!! Yes, we’ve all been traumatised after finding them lurking, sliced and flaccid, on the edge of our salad, but did you know that the humble cucumber actually packs some nutritional punch? There’s plenty of water, vitamin C, vitamin A and folic acid in the pale inner flesh, and fibre, molybdenum and silica in the dark green skin, you could soon be crunching your way to better hydrated and firmer skin! → Metabolic Balance? Ah, so that’s what you mean!